If there’s one thing in life that’s more prone to emotional obsession than a cool motorcycle, it’s an honest to goodness Hollywood star. Exhibit A – pretty much any teenager’s room. Show me a kid with hormones raging and I’ll show you enough posters of famous faces and cool vehicles to sink the Titanic – James Cameron’s balsa wood recreation or otherwise. So when Spain’s Macco Motors took one of their dreamy creations and added Hollywood dreamboat Antonio Banderas, the results were predictably amorous. 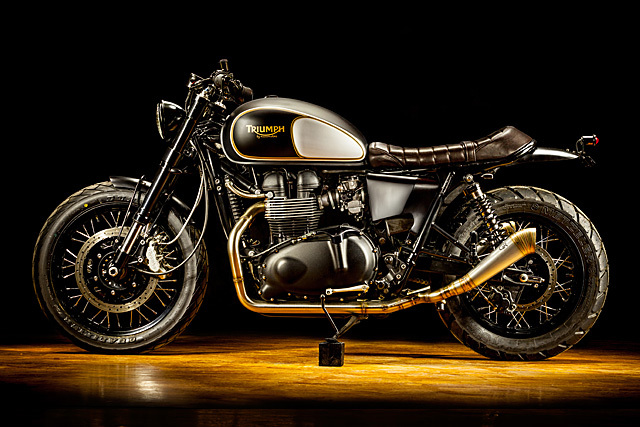 So be still your beating corazóns and check out this, the Triumph Bonneville that made Spain’s biggest movie star fall in love. 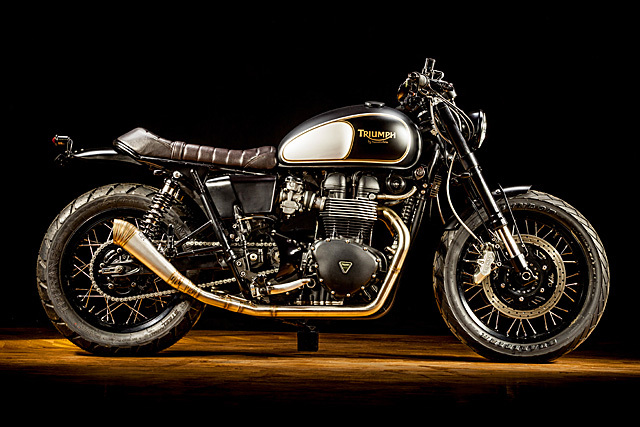 “It’s is a ‘09 EFI Triumph Bonneville T100 we found in really great condition,” says Macco’s Jose. “It’s got a special story, too. We built this bike because the menswear brand Selected Homme contacted us to help them launch a new range of clothes in Puerto Banús, Marbella, this past August. 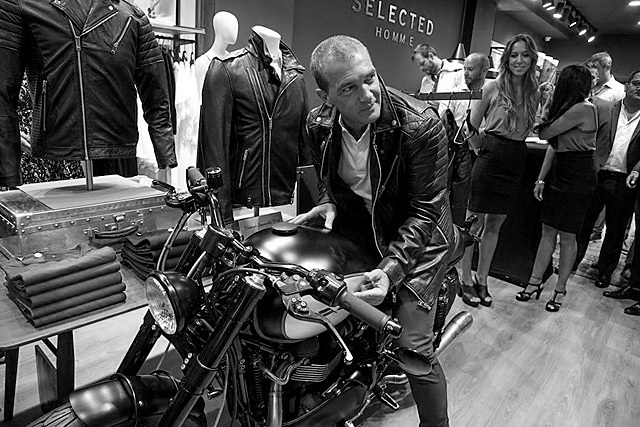 They were designed by none other than Antonio Banderas himself and were to be presented to the world’s press at this big launch party.” They contacted Jose and Tito to ask if they would be interested in collaborating in the event by building a bike that would complement the man himself and his very, erm, manly clothes. And so they did. It was about now the boys started bragging to us. As we are professionals, we refrained from poking fun. But just barely. “We’re happy to say that we had the chance to have a chat with Antonio about motorbikes. He said he owns eight motorcycles, which really impressed us. He turned out to be a really open and friendly person. This is a guy that really loves bikes and he was perfectly happy to tell us that he had fallen in love with our design.” Cue the animated cupids shooting sharpened spokes from a handlebar-shaped bow. True love. 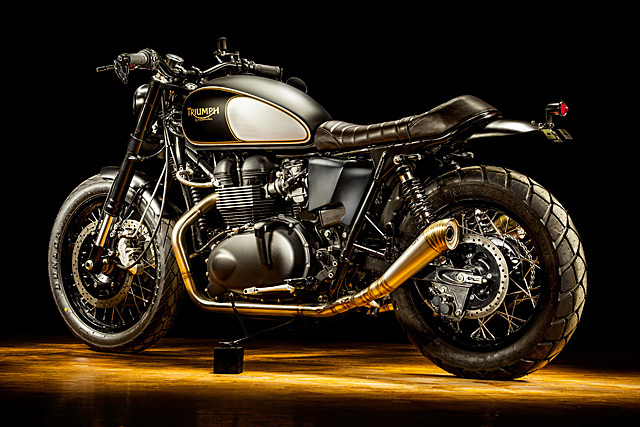 As you’d expect, the boys pulled no punches when it came to building a bike for such a high-profile event. “We went with a complete front fork conversion; we got a pair of brand new Ducati 749 USD forks, plus the matching Brembo brake calipers. 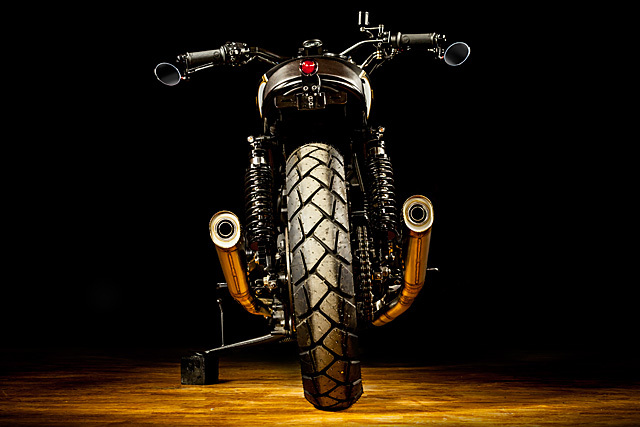 We mounted these to a set of Free Spirits triple trees and adapted the Ducati bars to fit.” Then, to allow them to fit the twin front discs brakes, they took an 18” Triumph Thruxton wheel and rebuilt it with a new hub. Once complete, it was finished off with a Nissin master cylinder and some top shelf brake hoses. “For Antonio’s event we painted the bike using his logo on the tank. 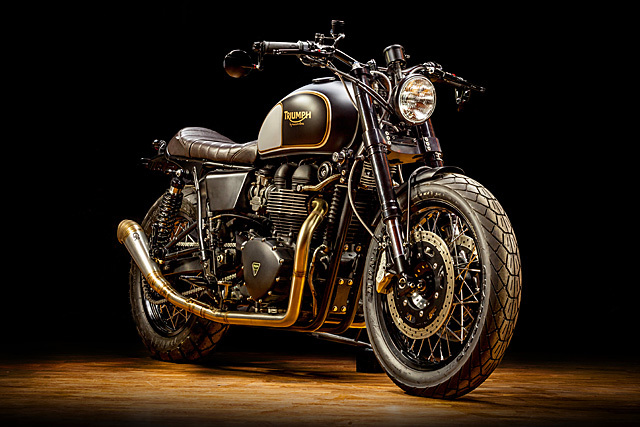 Then, after the event, we painted the tank again and went with a design we had in mind from the start of the project.” Needless to say, it’s a very classy interpretation of the Triumph logo done in satin black, gold and silver colours. The detail-obsessed amongst us will also notice that the exhausts system, made by GR Exhausts systems specifically for the bike, also matches this colour scheme. 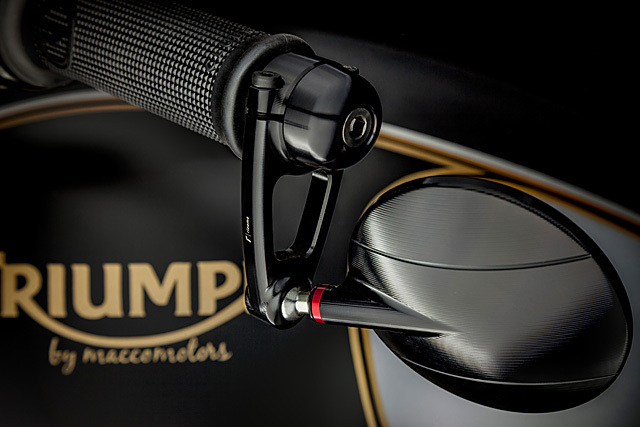 Wanting in on the hot Banderas hullabaloo, Italian company Rizoma delivered a veritable avalanche of their premium parts for the boys to use. 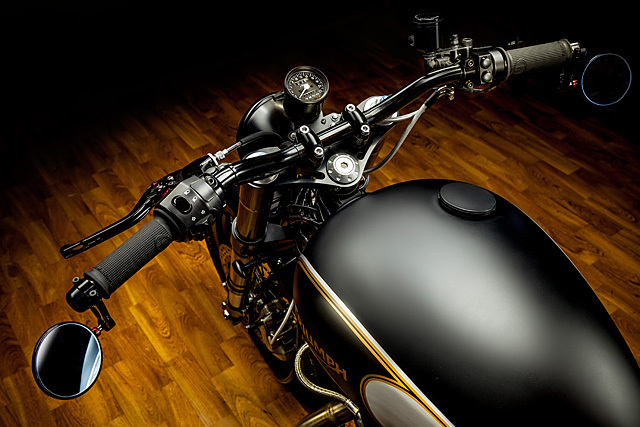 Scan the photos and you’ll see many of their goodies, including clutch and brake levers, a front fender, indicators, the gas tank cap, foot pegs, mirrors and a beautifully minimal brake reservoir. 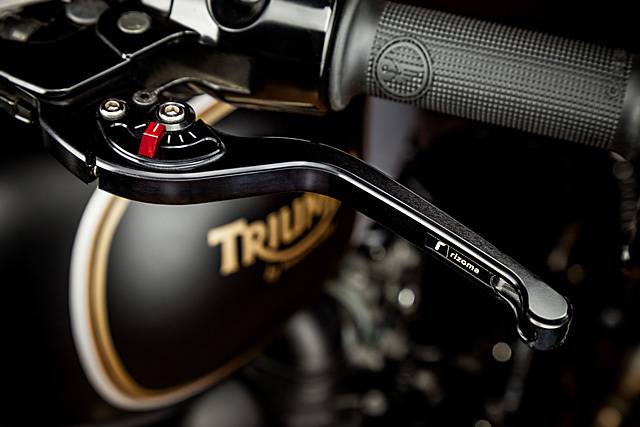 Other parts expertly selected and attached are the Biltwell Tracker handlebars, the Bates-style headlight and the LSL Clubman grips. And while the single speedo isn’t going to win any who’s who name dropping competitions, its no-nonsense functionality somehow manages to work within its celebrity surrounds. Surrounds that now don’t contain and ignition due to the unit being relocated to the bike’s right hand side just behind the rectifier. The bike’s finishing touches came by means of a new fiberglass rear guard mounted beneath a freshly fabricated subframe. Then perched on top of this is a brand new Maccomotors seat. And anyone who knows anything about Macco will know that they love their seats looking just so. Then a pristine pair of Hagon Nitro rear shocks were bolted up to make sure that the rear ride quality was up to the standard being delivered by the Ducati Showa unit at the front. A Dunlop F20 110 was now introduced to the pointy end, while a Metzeler Tourance 140 dances away out back. The final touches before the Banderas buttocks got to touch the leather include the custom-made fiber glass side panels and a completely new paint job that was spec’d to make sure that pretty much nada of the bike’s naked parts were left uncovered.